Warning: Some of the images that follow may cause distress for men everywhere. Believe it or not but some men out there don’t actually like shopping. Not one bit. And if you think that’s just a bit of lazy gender stereotyping, the Instagram account “Miserable Men” is here to prove you wrong. It’s a collection of some of the most hilarious images of men looking tired, bored and suffering all while existing in a retail setting. Judging by the images on offer, these guys have been waiting around while their other halves are busy shopping away. Then again, they could simply be getting a bit of respite from the relentless torture of the standard retail experience. Some fiddle away on their phone, hoping the pass the time. Others simply sleep through the agony, hoping to wake up and discover it’s all been a bad dream. Then there are those who simply stare into space, wondering where it all went wrong. Whatever the choice, their spaced-out expressions and visible anguish make for amusing viewing, which is why loaded has collected together some of the Instagram account’s best and funniest images – keep your eyes peeled for a very famous face who ended up making the cut. Git in the car kids. Momma wants a new getup for Mother's Day. Evidently not shopping for suits then. Big Sale. Exciting Sale. Best Sale Ever. We’re getting sleeping just looking at this guy. Waiting patiently? Or crying himself to sleep? When you need to sit down regardless of the consequences. This is basically like being on vacation. Are you gonna pick that up? Lots of #miserablemen out today having a blast on #blackfriday. Don't give into the dark side. Turn back to the light my friend. I like this guy's style. Two Big Gulps. Solid frown. I could do without the sandals though. #miserablemen to the core. 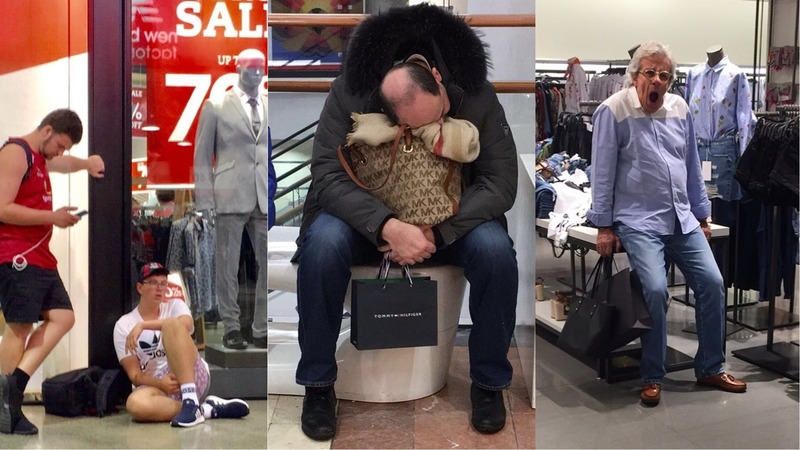 For even more shots of men looking tired and pissed off while out shopping, head over to the Instagram page Miserable_Men for even more of the same.